We love our dogs. We’d do anything to keep them happy, and we only want the best for them! Our golden retrievers are loving and caring dogs but can get very bored, very quickly. It’s up to us as owners to make sure this boredom doesn’t get out of control! To keep them happy and healthy, golden retrievers need lots of mental stimulation, but that doesn’t mean you need to think of things to do with your dog 24/7. Getting a hold of a few good quality interactive toys will make sure your pet gets the stimulation they need, while taking the burden of constant ‘entertaining’ away from you. 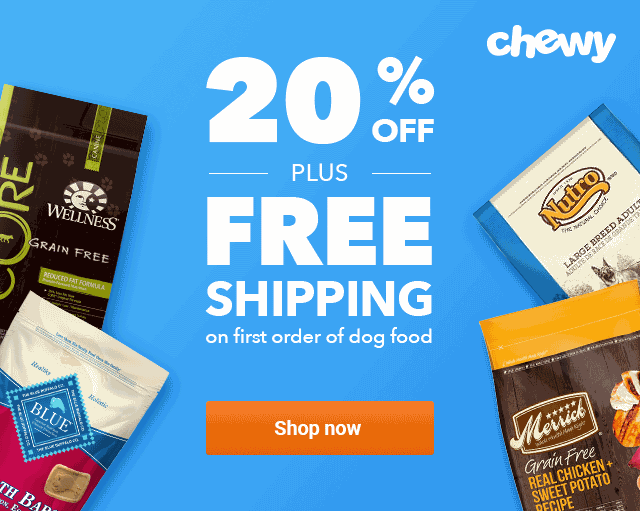 *Some of the above links lead to current prices and customer reviews on Chewy. 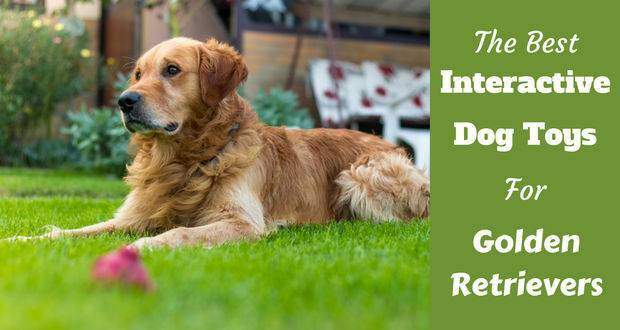 1 What Makes Interactive Toys Great for Dogs? 2 What Type of Interactive Toy is Right for My Dog? What Makes Interactive Toys Great for Dogs? The amount of dog toys available is massive, and while some of the common and more basic toys are great to have around the house, these can become boring very quickly for your dog. Noisy toys that will produce various sounds when your dog moves or bites on the toy. Movement toys that will move on their own, or take unusual directions when pushed around by your dog. Your dog can create their own dog games this way! Content toys that dispense objects (normally treats) when your dog moves the toy around or ‘solves’ the puzzle. Double action for more fun! Remember that you should make sure that your dog is supervised when playing with any toys for the first time or toys that can break. What Type of Interactive Toy is Right for My Dog? Will you use it indoors or outside? How often will you give the toy to your pet? Treat dispensing toys obviously need to be monitored to make sure your golden retriever doesn’t start to get treats too often. How much space do you have? 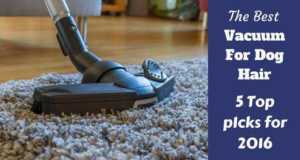 There are products that are great for use in smaller spaces, but some of them are larger, or need a fair amount of space to work properly, so be careful to get something suitable if you don’t have a huge area for your dog to play in. How much do you want to spend? There are toys out there to suit every budget, so get an idea of how much you want to invest in an interactive toy before you start looking. How does your dog like to play? Consider if your dog likes tugging, stuffed toys, tough dog toys, plush dog toys, squeaky toys, soft toys, or chews. The best dog toys for the pet like yours will depend on your pooch. Not all dogs are the same! How strong is your dog? Another thing to consider is whether or not you need to get indestructible dog toys. A large dog with destructive tendencies will need a stronger toy to play with. A toy for dogs that can’t be easily destroyed by chewing is very valuable! We‘ve created a list of some great interactive toys here to help you decide which style would be best suited for you and your dog. Take a look at our reviews for these top pet products below to make sure they’ll meet all your needs before you buy! This is a really nice treat dispensing toy that’ll keep your dog occupied for hours. Once you’ve hidden the treats under the blocks on the toy, you can sit back and watch as they move the blocks around one at a time, and are then rewarded for their work as they reach the treat. Not only is this a good toy for play and mental stimulation, but you can also use it to help basic training commands including sit, wait and go ahead. The tough design means this is a hard-wearing toy that you can keep using to entertain and treat your dog without the need to constantly supervise. Being dishwasher-safe makes this toy very easy to keep clean and re-use again and again. You can use this toy as a training aid to help teach a range of commands. The ‘puzzle’ element of this toy means your golden retriever will be entertained as they try to find the treats. As far as puzzles go, this one is at the harder end of the scale, so your dog will need to be patient enough to work out how to get the treats, or you may want to give them a few extra clues if they aren’t getting the idea! You can add plastic bone shapes to make the puzzle harder, but these can be chewed if your dog takes them off, so make sure you remove them from your dog if they do decide to chew them. 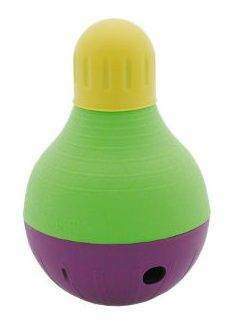 This toy uses sound to set it apart from other ball toys, as it produces a giggle sound when it’s moved around by your dog. The size of this product makes it perfect for both indoor and outdoor use, so you can take your pick as to where you want to let your dog play with it. 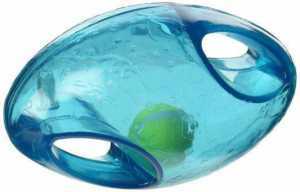 The design of this toy works really nicely for dogs, as there are ‘clutch pockets’ spread over the ball’s surface to make sure you dog will easily be able to pick up the ball and walk around with it. The noise from the toy is produced by small tubes, so there are no batteries that’ll need replacing if this becomes your dog’s new favorite item! If your golden retriever has lots of energy, try using this product to play chase with – the ball will start making noise once it’s rolled or thrown, so dogs love to push it around once it gets going. This is a hard wearing toy, designed to survive energetic play sessions. Although this is a hard wearing toy that can survive play sessions, it’s not designed to be chewed on, so it’ll start to deteriorate if your dog starts to bite and chew on it rather than chase it. This is better suited to energetic and playful dogs who are already trained to only chew certain dog toys. Whether you want to treat your dog, or make their main meal more interesting, this is a really nice product to have around the house. 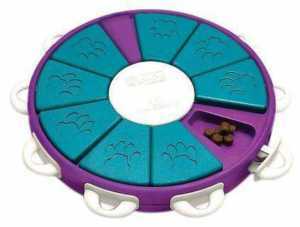 You can fit up to 3 cups of food inside the toy that will dispense gradually as your dog plays. To make the toy more challenging to get the food out, the openings are easily adjustable if you want to change them. This is also a benefit as you can change the size of the opening to best suit the food or treats you want to put inside. This toy always ‘bounces’ back up when it’s pushed around, so there’s never a risk of all the food falling out. Once your dog realizes how to access the food (it’s best to start them off with treats), you can let them eat whole meals in this way to keep them entertained and stop them demolishing a meal in a few minutes! Because this is a fun and slow way for your dog to eat their food, you can put an end to any problems like bloating caused by eating too much too fast. You can’t see inside properly when you are cleaning this, so you’ll need to make sure you give it a really good rinse to ensure there are no leftover suds from the wash. This isn’t designed as a chew toy, so if your dog gets bored of looking for the food and decided to chew the top, you may find it needs replacing quite quickly. If you have some outside space that your dog loves to play in, this product is a great way to help them burn off some of that excess energy that can build up between walks. This toy is designed for larger dogs, and because your dog can be very playful when using this product, it means they can get some brilliant cardiovascular exercise as well as mental stimulation golden retrievers so desperately need. A well designed ‘quick connector’ means you can easily change the toys your dog can play with, so whether they’ve chewed one to the point where it needs replacing, or you just fancy treating them to a change of toy, this is a lovely quick step to complete. It’s very simple to change the toys used with the ‘quick connector’. Having an outdoor interactive toy like this one means your dog can get much more exercise than if they were only being walked. Although you do need outside space, you don’t need much of it to be able to give your dog hours of fun with this toy. If you have a very playful dog, you may want to think about re-enforcing this toy in the ground by digging a deeper hole, or adding some concrete to make sure it stays put for even the most excited dog. 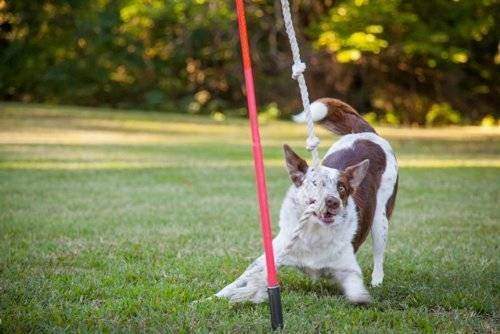 This simple idea gives simple games with your dog like fetch a lovely new twist. The outer football shape contains a tennis ball, and this along with the loud squeak produced helps keep your dog interested and intrigued. The product is designed to be hardwearing, and has handles on either end to help your dog interact with the toy more easily by picking it up and shaking it. This toy is plenty big enough for larger dogs to play with, and it’ll keep them entertained for long periods of time. The football shape makes it great for chasing because your dog will never know what direction the ball will head once it bounces. 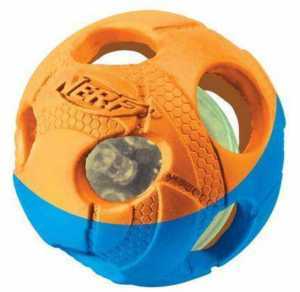 The squeaker will keep your dog’s attention, while the inner tennis ball will intrigue dogs that are more interested in puzzles, so this product is a great ‘all-rounder’. As with all toys, if you let your dog chew on the handles, or let them try and rip at it to get the tennis ball out, it will not last long! If you catch your dog presenting this kind of behavior, try showing them how to play with it properly to help make sure this is a toy they can enjoy in the long term. This fantastic unique design is a big hit with many dog owners, and is designed to be great for tough chewers. Because this product can hold treat rings in various places, it allows you to make the reward easier or harder to get to, meaning it’s easy to adapt it to better suit your dog’s needs. Even though this toy is already great value for money, you get treat rings included with your purchase, so you can let your dog play with it as soon as it arrives. Being dishwasher safe makes this toy easy to clean and re-use on a regular basis. The refill packs for the treats are available in a variety of flavors, so you can keep your dog interested in the toy by using creating different tastes and smells. If your golden retriever likes puzzles, there’s the option of putting the treat in a harder to access area, meaning they need to work out how best to get to it before they get the reward. Once your dog has finished with one of the treats, this is nice and easy to clean (in the dishwasher or by hand) and re-load with a new treat to keep them entertained. Good toy for grate training; can work as a treat for a small or larger dog. Do keep an eye that your dog doesn’t take a liking to the end that you need to unscrew to re-load the treats…too many teeth marks here might make it hard for you to get it undone as easily as it should be. 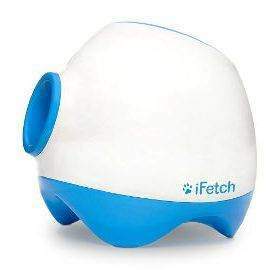 If you have an active dog that loves to fetch, you can’t get a better product than this! While it’s a bit pricey, this is an investment that’ll be well worth it in the long run…no more having to throw the ball until your arm hurts and then watch your dog’s disappointment when the game is over. This product means the fun can be endless for your energetic golden retriever. A great feature of this product is how easy it is to reload…it is so simple, you can actually train your dog to do it for themselves, meaning you can sit back and watch while you dog has hours of fun. Feel like you’ve seen something like this before? While there are several machines similar to this one, they’re often designed to launch smaller balls which means they aren’t a good idea for larger dogs, but this version uses full size tennis balls, so it’s the perfect gift for a fully grown golden retriever. Adds new levels of fun and independence to the classic game of fetch. You can train your dog to reload the machine by itself, so they can keep playing for hours on end. Pet-safe tennis balls are included with the product so you can start using it as soon as it arrives. Full size tennis balls fit this machine, making it perfect for larger dogs. 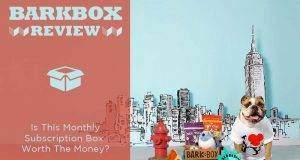 This is the most expensive product we’ve reviewed, but because your dog doesn’t play with the machine itself, you don’t need to worry about it being chewed and needing to get replacements. You should only ever need to replace the tennis balls! You do need a good amount of outside space to get the most from this toy. So are interactive toys as good as they seem? 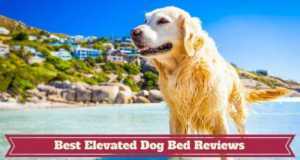 All dogs need mental stimulation to help keep them at their best, and this is seen even more in breeds like golden retrievers which are a sporting breed with high motivation. As a dog owner, its your job to think about this. Toys for dogs like yours are very important. Think about what type of toy your dog will enjoy most (are they likely to prefer puzzles, or more energetic toys?) and invest in a few good quality options, then sit back and enjoy as your pet is kept occupied and entertained for hours on end.